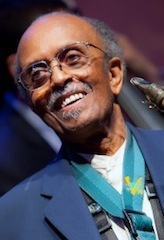 There was no one happier than Jimmy Heath onstage at Corbett Auditorium Thursday night. Appearing with the Cincinnati Contemporary Jazz Orchestra, jazz legend Heath, 86, grinning ear to ear, kept his audience toe-tapping and clapping in the first Constella-produced event of the 2013 Constella Festival of Music and Fine Arts (Constella works in partnership with other Cincinnati arts organizations to create the annual festival). The event was a jazz-lover’s delight and marked the return of the CCJO for the second year in a row. Always in motion, with pointed cues and a big smile for everyone, Heath cut a picturesque figure in front of the orchestra. He led off with Charlie “Bird” Parker’s “Yardbird Suite,” which brought saxophonist Jeremy Long and pianist Phil DeGregg to the fore, as well as Heath on alto sax. Belck stepped in for Jimmy Dorsey’s “I’m Glad There is You,” where Heath waxed soulful and tender. Heath’s “Sassy Samba,” dedicated to Sarah Vaughn – “the greatest female vocalist ever” -- saw Heath on soprano sax in a performance that was, well, sassy, with Art Gore a standout on drums. This led into his “Sound for Sore Ears,” where drums punctuated by trumpets set the stage for some colorful improvisations by Heath and members of the CCJO on trombone, sax and trumpet. Billy Strayhorn got a great big nod in his “A Flower is a Lonesome Thing,’” which opened forlorn before hitting its joyful stride. In his own “Billy’s Stray Horn,” led by Belck, Heath grooved on soprano sax before straying off at the end. “Gingerbread Boy,” dedicated to Heath’s son, began with a gathering of saxes, became a big trombone choir, then blazing trumpets and more sax, with licks for bass and drums at the end. The clapping that began during this number continued long afterward in tribute to an evening that was exhilarating and well spent.